During my almost year long journey of learning new design techniques and making the decision to transition my business from an exclusive stationery shop, into a design company, I began to fall in love with surface pattern design. And, when I say fall in love….I mean I tripped over it, tumbled into a stream of patterns, and got stabbed in the rump with like ten thousand of Cupid’s golden arrows. Well, not really, but it is fun to tell the story that way! As a visual person, I was drawn to surface pattern design instantly and am continuing to build my portfolio of pattern collections. It did not take me long to learn pattern design concepts, since I already knew Adobe Illustrator. But, it became apparent to me that my design work was only being applied to one medium with my stationery company. Surface pattern design encompasses all surface mediums - fabrics, paper craft, ceramics - and is the art of applying color, texture, and repeating patterns to surfaces in our environment. I could design for home decor, clothing, party supplies, kids toys, stationery and gifts, office supplies, crafting, books, and more. I expanded my design business into these new mediums, recently illustrated my first children’s book project, and am already working on my second children’s book with another author. But, what I love most about designing repeating patterns is, it is a way to tell a story in a strictly visual manner. I do not necessarily need words to tell it. I adored the idea of telling a story through patterning, and give meaning to everyday things. Yes, not everyone will see the story I am telling in the collection, but, that is kind of the point. Not everyone needs to know the hidden story is there, but there will be some who will observe the story being told, or the pattern will speak to their own lives. My family will know the story is there, and for me, that is what matters. Most of my inspiration comes from my family, our children, and our adventures together in this busy world. It is the story of us, and I am telling it in a way that is special to me. I am not doing it this way to be remembered, but to honor our lives and the precious memories we share together. One day, no one will know these stories, but they will be there, as we were, in this little corner of time. Now that I filled you in on how and why I started creating repeating patterns, I am going to show you, in this blog post series, how I create a pattern collection. We will start with developing an idea from concept to sketching it out on paper. Think about what in your life or past experiences inspires you, and envision the details of your adventures. Is there a story to tell? Try to immerse yourself in your idea without thinking about colors just yet. If it is the ocean that inspires you, think about all the things that remind you of the ocean, and try to come up with an unexpected reminder of the sea by looking at it in a new way. Pursue all angles related to your idea, for example, you could look at sea biology, ecosystem, volcanics of the sea floor, or the anatomy of a wave. A pattern collection can consist of any number of patterns, but I like to create 8-10 patterns in a collection. Not all of my collections have that many, but having a number of patterns within the collection will really show your talent in unifying your designs. It will make your work stand out, and offer your customers a range of options in combining multiple patterns. I designed this handy Pattern Concept Workbook to assist you in planning your ideas for your pattern collections. Print it out and take at least 30 minutes to brainstorm and plan out your pattern collection with this helpful tool. I am using my Pattern Concept Workbook for my newest pattern collection. This new collection is the story of my daughter’s favorite doggie she calls Good Boy. I am going to tell the story of how he became a part of our family, their adventures together, and how special he is to our family. Creating an inspiration board is not a necessary step, but it is a great tool to keep you in line with the feel you want for your design. It should guide you to the style and tone of your sketches. But, be careful to use your inspiration for just that, inspiration. Do not to use it to copy anyone else’s work. I use Pinterest to create inspiration boards, and it is a fantastic tool for assembling ideas. I also create a separate inspiration board in Adobe Illustrator, pulling in some photos from my Pinterest board and mixing them with photos I have taken myself. Then, I print out the board so I can reference it while I am sketching to keep me on track with the feel of my design. 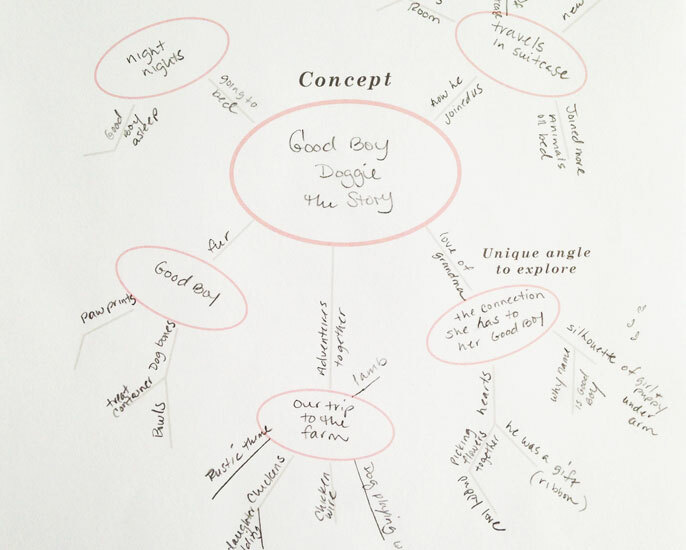 Now that you have some ideas, you can begin sketching using your mind map as a guide. You will need a pencil, good eraser, plain printer paper, and hard surface to write on. I like to pick a quiet, comfortable place to sketch. One where I am relaxed and the ideas can come easily. This is usually my favorite corner of our couch where there is a nice reading lamp to provide soft lighting while drawing. Focus on just one circle of your mind map at a time. Start by drawing what comes to you while glancing at what you jotted down on the worksheet. Try to keep your sketches a decent size, and do not draw them too small. This way you have enough space to add in little details and accents. 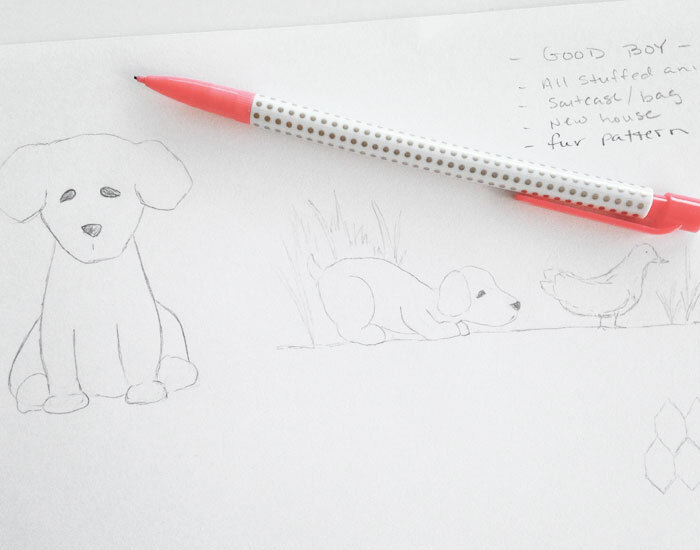 Take a peek at the first few sketches of my newest collection. The next post in this Creating A Pattern Collection series will discuss coloring and digitizing your sketches, and I will give some information on where to find some great videos from awesome designers on learning surface pattern design. What is your inspiration? What mediums do you want to see your patterns on? Tell me in the comments below!